UPDATE: On 9/27 I attended a meeting with San Antonio Mayor Ron Nirenberg where he suggested citizens vote NO on annexation. The CoSA is only looking for “land use control” to control dense development around local military bases to protect them against BRAC realignment. The city is concerned about the financial impact of extending city services to additional property owners who don’t want/need the services and don’t wish to have the additional property tax implications. This is just the only process allowed by the state legislature to meet the cities objectives. Even with a NO vote, CoSA gets their land use control and there will be no change to property taxes in the ETJ. 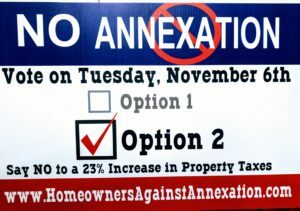 Below you will find links to detailed information regarding the ballot initiative this November for City of San Antonio annexation within their ETJ. The city’s focus is on acquiring Land Use Jurisdiction around local military bases to protect their viability by preventing dense development. Existing residents see a sharp increase in Property Taxes with little perceived benefit from city services.